Andy, as a software engineer, has been working too late every day. When asked why he always works overtime, he told us that there is nothing to do when he gets home early. Hence, he always pays almost all of his attention to work. 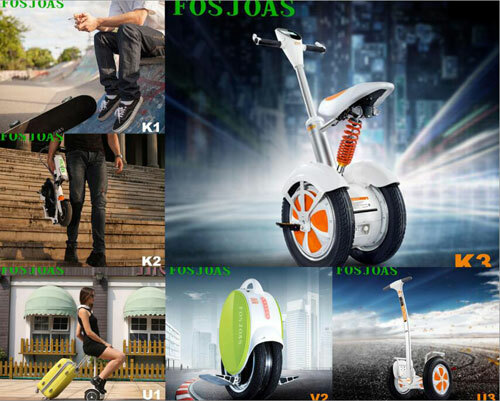 His life does not change until he finds the Fosjoas electric self-balancing unicycle, a smart and cute gadget. It has become his commuting tool, exercise tool and entertainment tool. A boring and uninteresting life will be changed by something small. In the first place, the Fosjoas self-balancing electric scooter is Andy's commuting tool. Sometimes, he takes his car to go to work and sometimes, he goes to work by bus, which is as boring as his work. After he rides Fosjoas intelligent electric scooter to go work, his working efficiency has greatly enhanced, to his surprise, as he has more time to enjoy the beauty of the city and a better mood and spirit is the key factor for a higher efficiency. Then, the Fosjoas electric self-balancing scooter is Andy's exercise tool. A regular riding of self-balancing scooter is helpful to people' health and state of mind, as it builds up rider's body. Riding half an hour of self-balancing scooter will consume certain calories, which is conducive to reduce weight and keep a good figure. Also, the Fosjoas electric self-balancing unicycle that is adopting aerospace attitude control theory, fuzzy software algorithm and gyroscope system to maintain balance by leaning forward and backward is Andy's entertainment tool. Taking picnic or a journey will be much more intriguing with Fosjoas electric self-balancing scooter. In a word, Fosjoas self-balancing electric scooter affects Andy's life significantly, from daily commute and daily exercise.